River Vale Realtor | Pascack Valley Real Estate - Expert Local Real Estate Information from Susan Laskin, Your Pascack Valley Realtor! Pascack Valley Real Estate – Amazing River Vale BiLevel! Amazing Cathedral Ceiling Great Room! Updated Center Island Kitchen! Spacious Rear Yard! 635 Orangeburgh Rd in River Vale is an Expanded Home on exquisite & picturesque setting boasting a 26′ Victorian Style White Bridge and 2 Full Levels of Living with Extended Family Opportunity. Click here for more photos & information! Take a Virtual Tour of this home! Looking for more Pascack Valley Real Estate? Browse through my Feature Homes! Some incredible listings across the wonderful Pascack Valley towns! River Vale Real Estate – Incredible Private Cul de Sac! Amazing Curb Appeal! One of a kind! Hidden Away from view, this Expanded and Renovated Custom Home will entice you! 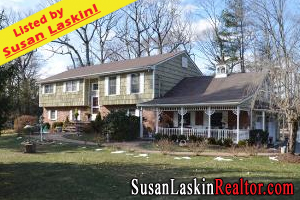 1.4 flat acres of remarkable property rarely found in the Pascack Valley! 263 Rivervale Rd in River Vale ($679,950!) is a Custom Home set on an amazing private Cul de Sac! The Immense Cathedral Great Room addition has skylights & huge Palladian window opens to the updated Kitchen w/ Breakfast Bar. Large Formal Dining Room w/ doors to Great Room. French doors from the Great Room lead to an expansive deck overlooking the picturesque property. Impressive Formal Living Room & Immense Family Room/Fireplace. Updated Main Bath. Master Suite w/Master Bath. Lower Level is another full Level of Living Space. 4th Bedroom. Updated Powder Rm..Sitting Room and Partially finished Room with Doors to private deck. Click here for more photos & information! Browse through more Pascack Valley Real Estate! 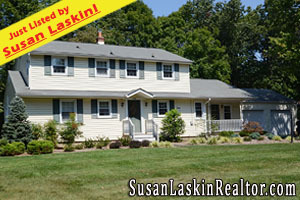 River Vale Real Estate – Sold by Susan Laskin, Your Pascack Valley Realtor! 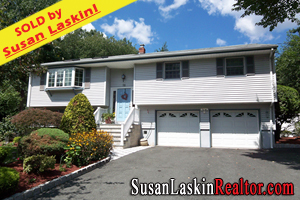 Sold by Susan Laskin, Your Pascack Valley Realtor! #1 Agent in the #1 Pascack Valley Real Estate Office Eight Consecutive Years! 2005 – 2012! 72 River Vale Road in River Vale – an incredible example of the wonderful River Vale Real Estate! Wonderful Updates! Incredible Lifestyle! Learn more about the Pascack Valley town of River Vale, New Jersey! Read the latest River Vale Real Estate Market Report! Thinking of buying or selling? Read my Tips for Buyers & Tips for Sellers! Pascack Valley Real Estate – Twp of Washington, NJ Market Report! Twp of Washington, New Jersey (known as the Hub of the Pascack Valley) saw the sale of 11 homes during November of 2012. The average List Price was $508,873. The average Sold Price was $473,764. The median Sold Price was $460,000. On average, homes that sold in Twp of Washington during Nov 2012 sold for 93.10% of the List Price. In addition, there were 11 Twp of Washington homes on the market at the end of Nov 2012. Their average List Price was $441,000. Learn more about the town of Twp of Washington, New Jersey! Browse through some local Twp of Washington & Pascack Valley homes for sale! Pascack Valley Real Estate – River Vale NJ Market Report! River Vale, New Jersey (known as the “Garden Spot” of the Pascack Valley) saw the sale of 8 homes during November of 2012. The average List Price was $595,338. The average Sold Price was $515,000. The median Sold Price was $450,000. On average, homes that sold in River Vale during Nov 2012 sold for 86.51% of the List Price. In addition, there were 10 River Vale homes on the market at the end of Nov 2012. Their average List Price was $544,820. Learn more about the town of River Vale, New Jersey! Browse through some local River Vale & Pascack Valley homes for sale! River Vale Real Estate – Expanded Colonial! Location, Location, Location! Expanded Colonial with hardwood floors on both levels! 558 Wittich Terrace in River Vale ($488,950!) is set on a flat and sumptuous 116 x 191 property and boasts the pivotal “WOW Factor!” Family Rm/Dining Room expansion w/ cathedral ceiling and a wall of French Doors leading to deck and exquisite rear yard..Main Level is Large Living Rm/Bay Window. Front to Back DR/Family Rm/French doors..Eat in Kitchen,Bedroom, Den and Full Bath..Upper Level has Four Bedrooms (yes..all with hardwood floors)..and a Bath (SS)..Central A/C..Gas heat..Recessed Lighting..Updated Windows..Master BR with Wall of Closets..Laundry Closet Main Level..original owner..Covered Front Porch..2 car garage..AMAZING VALUE!